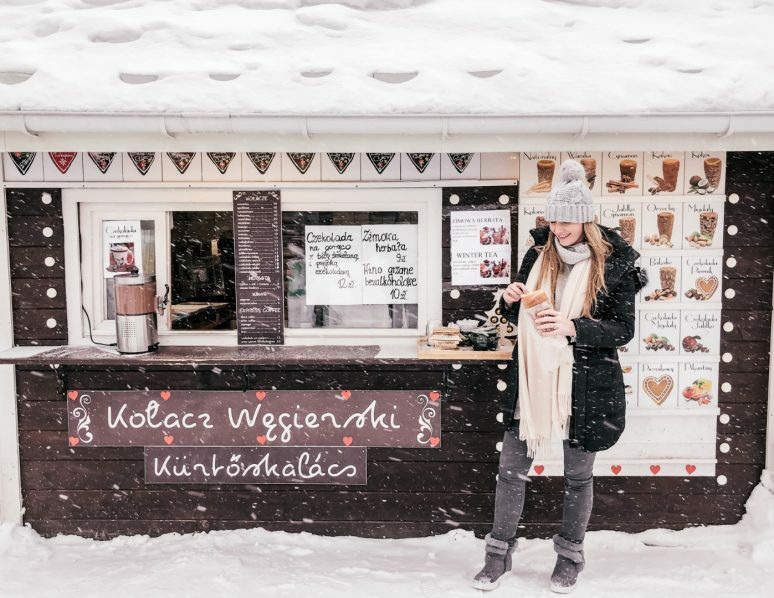 Poland is a lesser visited gem of a country that everyone should put on their travel list, and you can see a good amount in a quick three day itinerary. 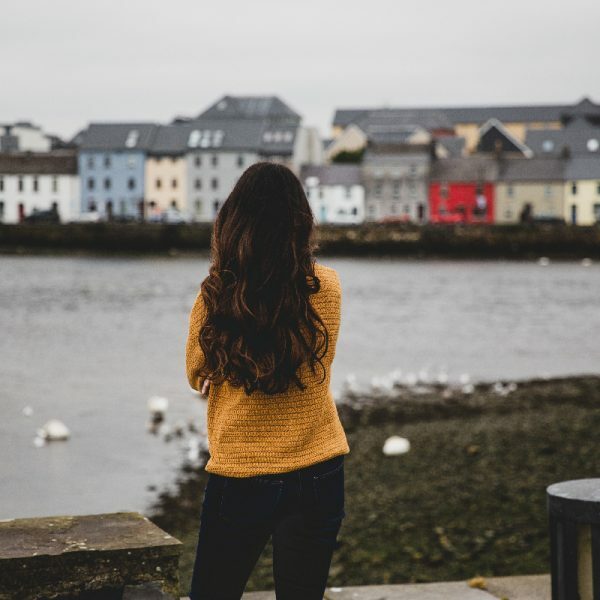 After being in England over the holidays and craving a nearby winter trip, I used the handy ‘everywhere’ feature of Skyscanner and looked for the cheapest flights. 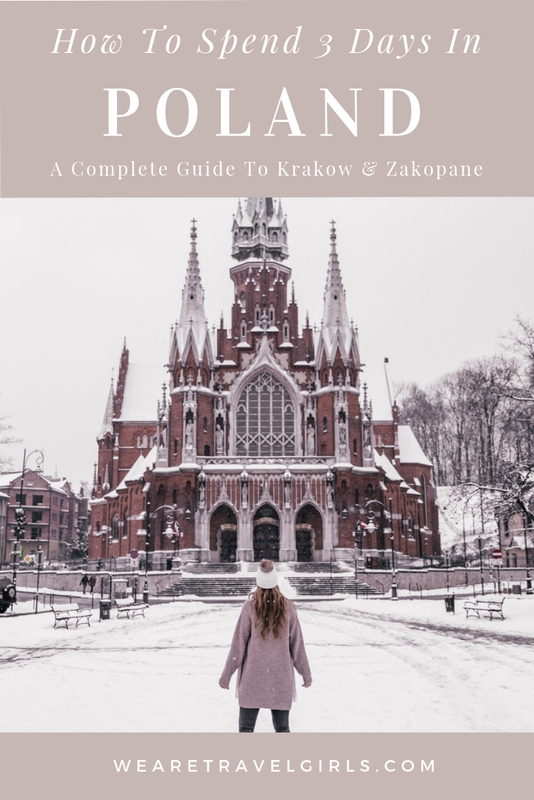 I found round trip flights for around GBP 50 from Bournemouth to Krakow, and after a quick bit of research and Pinterest exploration (my favourite way to plan travel! ), I discovered that Poland has a lot to offer its visitors and is a great winter destination. In addition, Poland is one of the cheaper European country when you get there, making it a great budget destination as well! In this article I share a few interesting facts about Poland, our exact itinerary of what to do with just three days and four nights in Poland, how to get around the country easily and cheaply, where to stay in Krakow and Zakopane, my favourite spots to eat and of course the best things to do in the country. Once I started my research, I discovered lots of interesting facts about Poland. It is the 9th largest country in Europe; they have an additional 6 letters in their alphabet; it’s home to the largest castle in the world; it has a diverse landscape to discover including desert, mountains, lakes, beaches and forests; you can eat at the oldest restaurant Europe called Piwnica Swidnicka and located in Wrocław; the name Poland derives from the word Polska “people living in open fields”; Poland is the world’s largest exporter of amber; mushrooming – going to the forests and picking mushrooms is a popular activity in the summer months; the fun trivia facts go on! 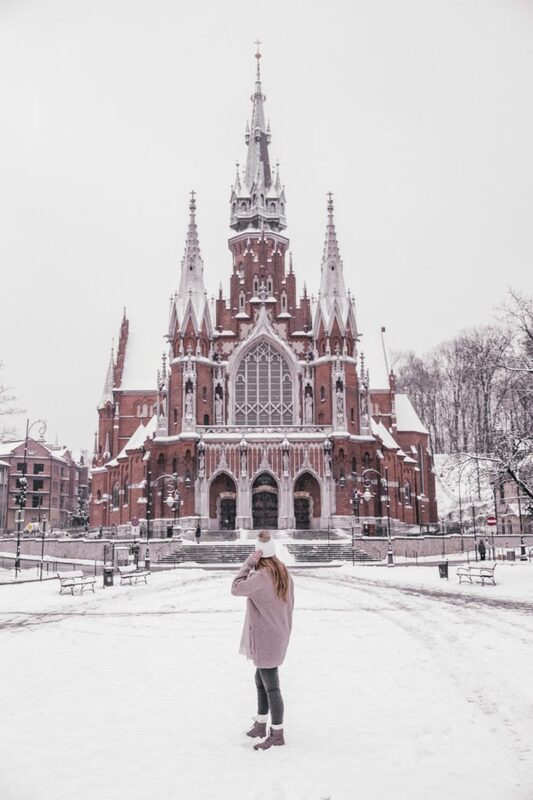 There is so much history to learn about Poland and so many interesting facts about the country to discover so take some time to read up about the country before your visit! First things first this guide and itinerary is called a 3 day guide, even though in fact it’s a 5 day itinerary with four nights in the country. This is because two of the days are assigned as travel days, so it’s a full 3 days of sightseeing. On the final day 5 depending on your flight time you may have extra time to explore in the morning and afternoon before your departure. What I cover includes these travel days, as well as what to do on the three full days that you have in the country. At the end of the guide i also share a few ideas on other things to do in Poland if you have more time. We took a morning flight from Bournemouth, England direct to Krakow with Ryanair which takes around 2 hrs 20 minutes. Flights from the UK are relatively cheap and you get can airfare for as low as GBP 15 each way. Our flight arrived in Krakow at 3.30pm in the afternoon, and since this seemed like a bit of a dead day we decided to go straight from the airport to Zakopane in the south of Poland. After a bit of research we found that buses run from the airport to Zakopane with Flixbus and are as little as GBP 4 per person! Timing this will really depend on where you are travelling from. For us this meant a few hours waiting at the airport at a Costa Coffee, but this was a better than staying the night in Krakow and travelling the next day losing one of the few days we had in Poland. The journey to Zakopane is around two and half hours and you can pre-book your exact seats with Flixbus. If you follow my itinerary you will arrive late in the evening to Zakopane on Day 1 of your trip. The bus station is around a 5-8 minute drive to the centre of the town and Google Maps told us a 10 minute walk – however, it definitely looked to be more like a 20-25 minute walk especially in the snow. Getting a taxi from here is pure luck, so if you can arrange a driver to pick you up from your hotel I would highly recommend that. 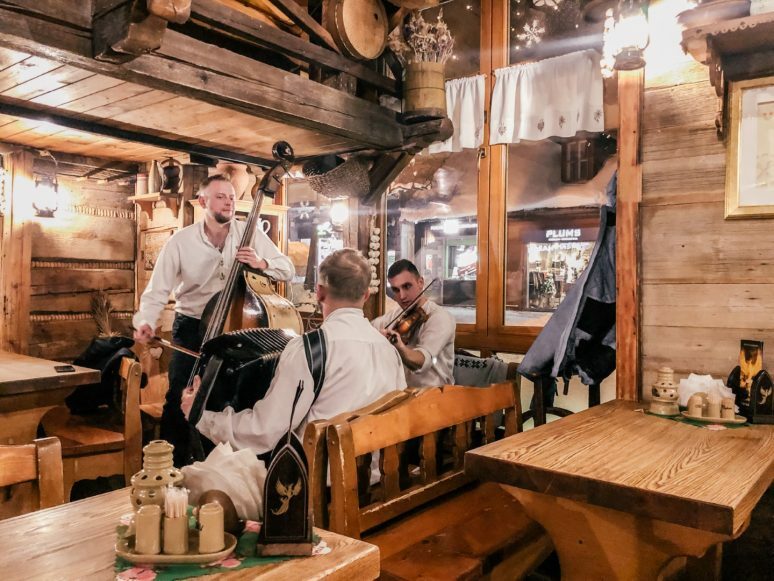 We arrived at our accomodation at around 9.30pm which allowed us to go out for a quick bite to eat before the restaurants closed for the evening – our first meal in Poland was at Zapiecek on Krupówki Street complete with live music. If you don’t go here on night one, make sure that you go at least once during your time in Zakopane as both the food and atmosphere were great! After arriving late in the evening on Day 1 to Zakopane, you can get up bright and early to explore this magical little city. 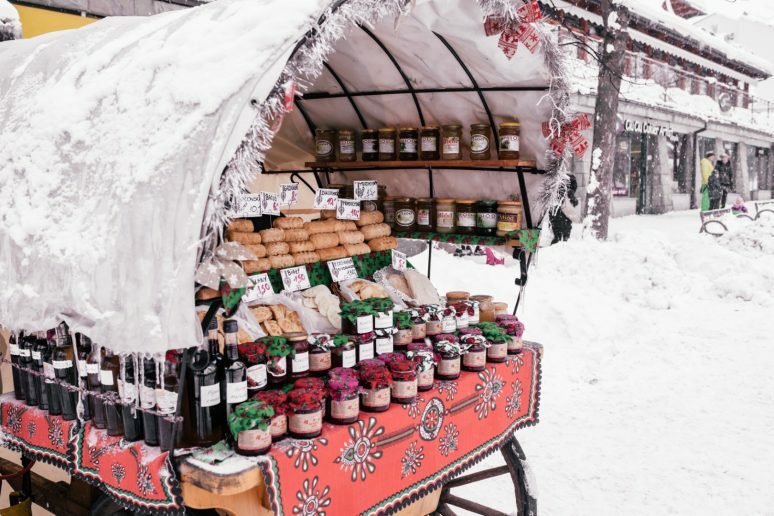 There is plenty to do to keep you occupied in Zakopane and I have highlighted my favourites and must-do’s when visiting Zakopane a little further down this article. There is also the option to go right out to the Tatra Mountains which create a natural border between Poland and Slovakia and visit the stunning Lake Morskie Oko. On Day 3 you can take an early morning or afternoon bus back to Krakow. Our preference was to take the bus around 10am and get to Krakow for lunch and to have to some time to explore the city during the afternoon. Ski & Snowboard Of course this is one of the main reasons that visitors to Zakopane come, the town is surrounded by mountains and is the perfect place to ski. Take the cable car to Mount Kasprowy (1987 m asl). If you only do one thing in Zakopane then it will probably be this. However, make sure to check the weather as it will not be as pleasant if the visibility is poor. At the top you can stand on the border between Poland and Slovakia and take in spectacular views of the Tatra Mountains. Take The Funicular To Gubałówka Hill which starts in the very centre of the town. The funicular costs around US $5 pp for the ride there and back and the journey is around 7 minutes long to the top. The more adventurous traveler can choose to walk all the way to the top which takes around 2 hours – along the ride you will see a number of people doing this. At the top on a clear day Gubałówka (1100 m asl) offers spectacular views over the town and the surrounding Tatra mountains. There is a market, a couple of coffee and lunch spots and also pretty light features and statues at the top to explore. You will also find that there are lots of horse and carriages for rent, though I personally would not do this and recommend you look into the ethics and treatments of the animals before you participate. Stroll Around Krupówki street. 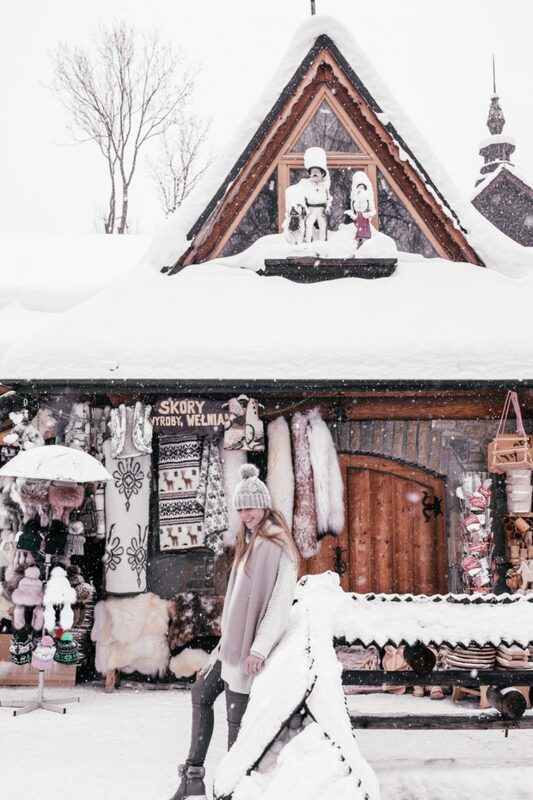 This is the main street in Zakopane and home to some designer shops, lots of boutique chocolate shops, many restaurants, ski and hiking equipment stores and some small food carts. No doubt you will find your way to this street at some point during your trip, mostly likely in search of a good place to dine – you will find my restaurant and cafe recommendations below. Explore The Local Market There is a small local market at very foot of the hill and Krupówki street which you will find if you are going to the Gubalowka funicular. This is the perfect place to buy some local produce and cheeses. 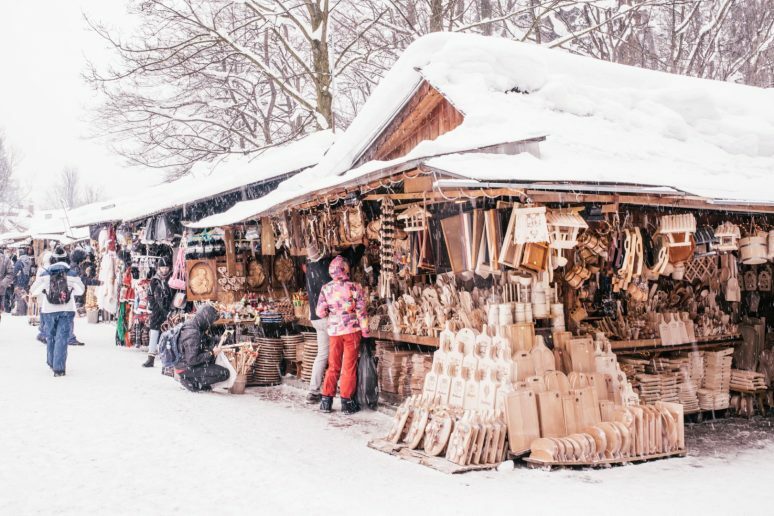 There are lots of wooden crafts on sale, as well as hats, gloves, faux fur coats and plenty of other winter warmers! Tatra Mountains The Tatra Mountains actually span Poland, Slovakia and Slovenia so you can visit from each. 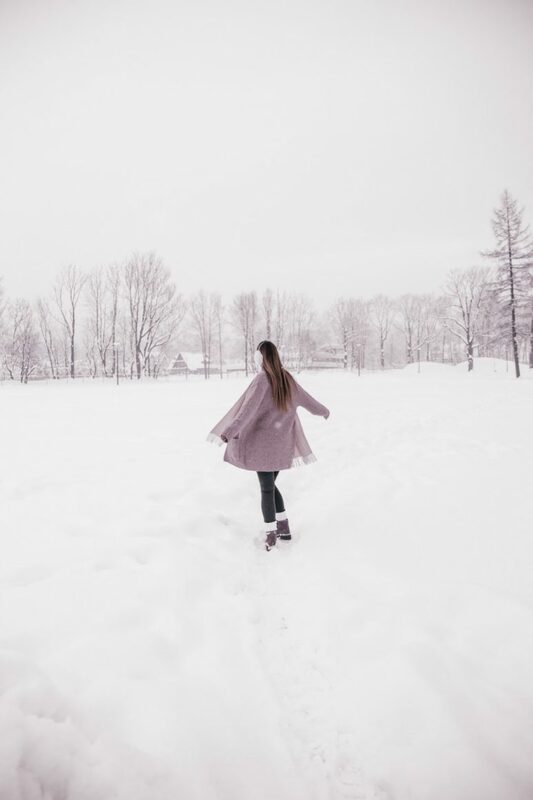 But from Krakow there are several day trips which take you out to Zakopane and to the Tatra Mountains at very reasonable prices, around GBP 35 pp including transportation, lunch and a guide. We didn’t choose this option since we were staying in Zakopane, but it’s an easy a cheap way to see this part of Poland in just one day. 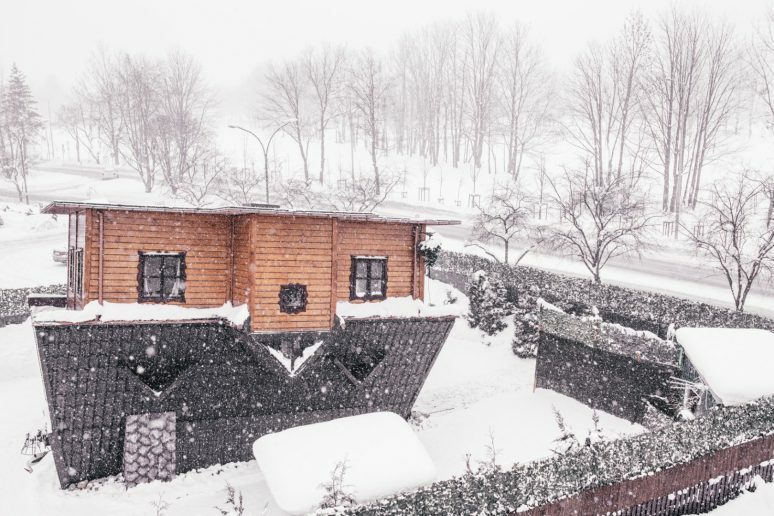 There are hundreds of options for places to stay in Zakopane, from lodges, small cabins, hotels to AirBnB. 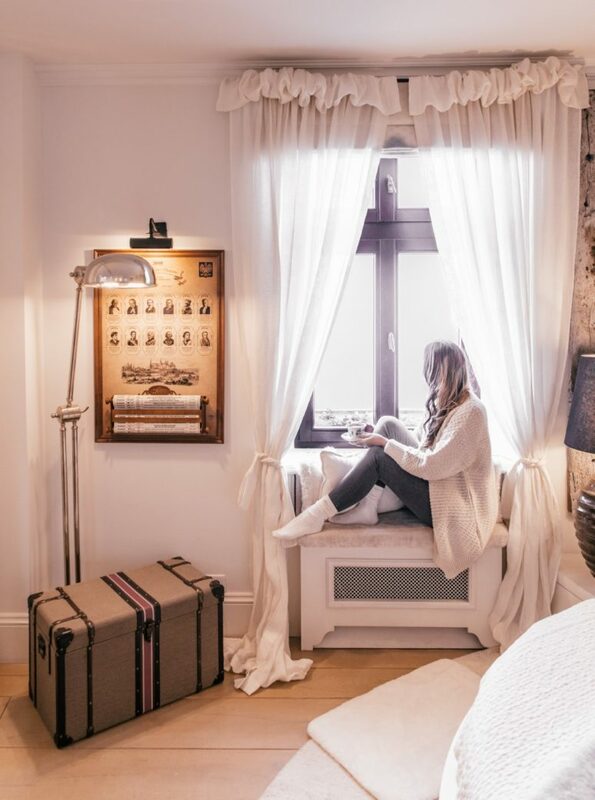 Depending on how you like to select your accommodation will determine which you choose, some people choose based on price, others based on location. 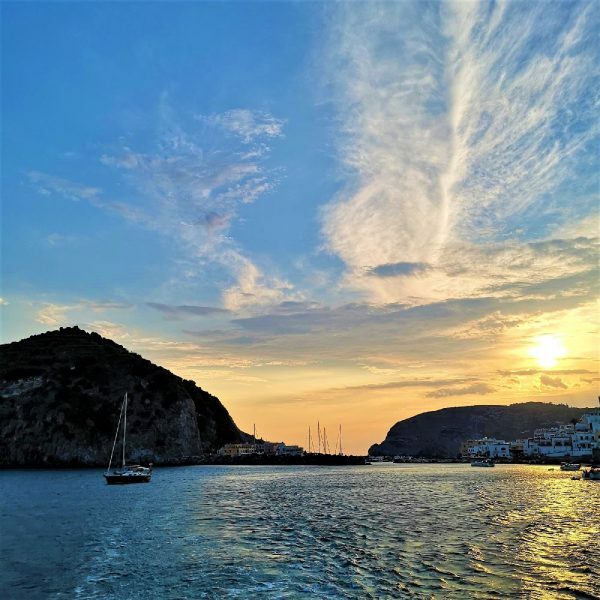 When we travel we typically look for a place that is reasonably priced and in a central location to avoid expensive taxis and make it easy to pop out for a bite to eat. Upon some research on Booking.com we choose Przy Szlaku Zakopane Centrum Pokioje & Apartamenty. These apartments are very centrally located, just one street back from Krupowki Street, so you cannot be in a better position! And at around US $55 a night they are very budget friendly. 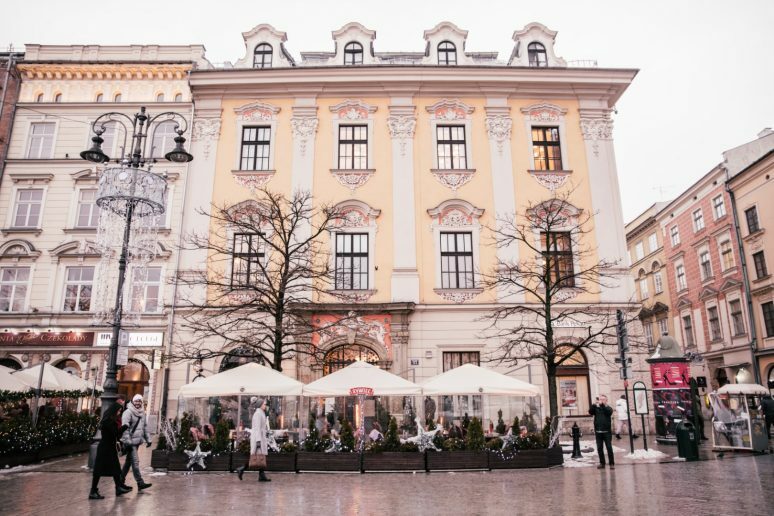 STRH Café is a great spot for breakfast or lunch, you will find it upstairs in a building with large windows overlooking Krupowki street. I choose the mountaineers porridge with cranberries, and apple sauce (delicious! ), but there are many more egg based traditional breakfast options. The décor is modern ski chic and the perfect spot to grab a book, coffee and relax for a few hours in a comfy chair. Samanta 1927 Below STRH you will find a café / patisserie called Samanta 1927. This place is like a luxury, retro diner, with pink and black velvet chairs and a huge array of cakes and pastries to choose from. This place would look more at home in Paris or New York, but is a cute spot right in the centre of town to enjoy some sweet treats. Zapiecek Our favourite spot in Zakopane was Zapiecek, half way up Krupowki street on the left. This is quite a small cosy traditional restaurant serving delicious Polish food with live music playing. We were hard pressed not to return for all of our meals. I highly recommend the traditional Highlanders Borscht, the warm slices of toast bread with plum wrapped in bacon and a garlic sauce and the cheese and potato perogies. We didn’t get the cheese board, but I saw it go past to another table and wished we had! Gazdowo Kuznia Similar to Zapiecek and at the bottom of town heading towards the funicular you can find Gazdowo Kuznia, another traditional Polish restaurant. This is a much larger restaurant so would work well for bigger groups. Cristina Restaurant and Pizzeria If you want a change from Polish food, then you can head to Cristina Restaurant and Pizzeria which is a great Italian place. I recommend the Cristina Pizza with gorgonzola and parma ham, the Cristina salad with apples and peach and of course the fresh burrata with baby tomatoes! On Day 3 it’s time to tear yourself away from beautiful Zakopane and take an early bus from Zakopane back to Krakow. Again I recommend booking the Flixbus. Before travelling I wanted to book a set with the best views, but honestly it looked like the views were beautiful from both the left and right hand side of the bus so you can pick either side. It is worth noting that the seats you book may not always be honoured, on our return journey we pre-booked seated so we didn’t rush to be on the bus first like some other passengers did. when we got to the front we were told there was no assigned seating today and to take any seat, so my advice would be to get to the front of the queue just in case seat reservations are not honoured on that day. If you have taken the earlier bus you will have some time to explore Krakow and get your bearings. We spent the afternoon heading to the main market square where St Mary’s Basilica is located. Along the way we admired the pretty streets of the old town, other beautiful and ornate buildings and stopped for some sweet treats and donuts along the way. On Day 4 you will have the whole day to explore historical Krakow. Get out your Google Maps and pin all the spots on my things to do in Krakow list below and then you can determine the more efficient route to create your own walking tour around the city. My absolute highlights in Krakow were walking along the river, crossing the bridges and watching life go by as locals went on runs, walked their dogs or sat on benches along this pretty part of the city and St Joseph’s Church which was magical and felt like we stepped onto a movie set or episode of Game of Thrones! 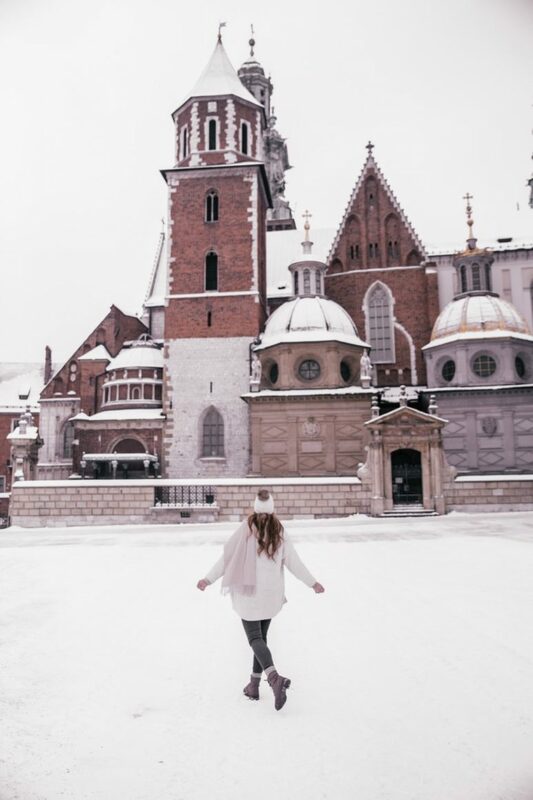 On the final day of your trip you will be heading home, if like us you have an afternoon flight then you can use the morning to explore Wawel castle and the cathedral. You only need to a few hours to walk the full perimeter of the castle and go inside the main cathedral so it is a perfect morning activity. For more ideas on things to do in Krakow on your final day see my list below. Wawel Castle and Cathedral It is free to walk around the castle or you can choose to take a guided tour which costs EUR 30 or an audio tour of the cathedral for around EUR 4.75. The castle is a must visit and is a great place to learn about Polish history. Botanical Gardens of the Jagiellonian University For the romantics and the lovers, a walk through these 18th century botanical gardens is a lovely way to spend an afternoon in Krakow. Be sure to check the opening times though as the gardens are usually only open between April and Mid-October. The Main Market Square It’s pretty certain on a trip to Poland and Krakow that you will find yourself in the main market square at some point, whether this is in search of a lunch spot or to visit St Mary’s Basilica. Take a Free Walking Tour Through Kazimierz This is one of Krakow’s most enchanting districts and a lovely place to wander around aimlessly along the pretty cobbled streets. In this area you will find an array of artisan shops and intimate cafes. Bernatka Footbridge If you are feeling romantic and travelling with a loved one you might want to take a walk across this pretty footbridge, where you can hang a padlock to side of the Bernatka bridge and toss the key into the river Wista below. This bridge is close to St Joseph’s church so if you follow my recommendation and go there you can cross it on the way there or the way back. Veit Stoss’ Altar Marvel at the beautiful Veit Stoss altar in St Mary’s Basilica. 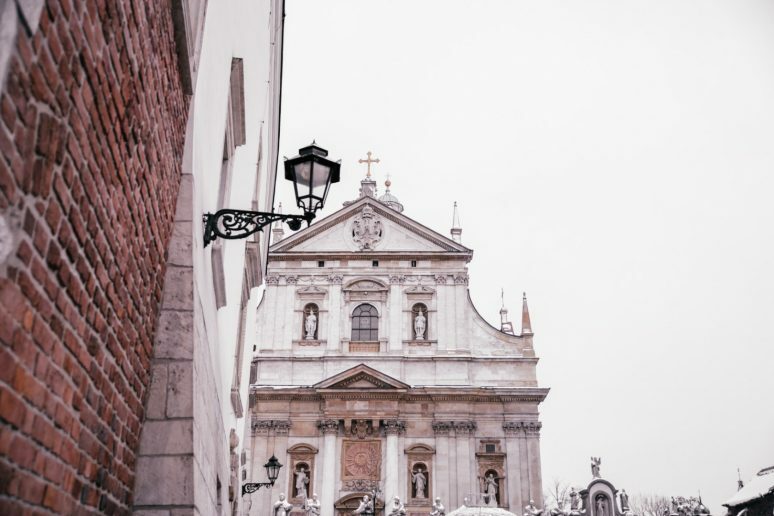 Krakow is jam packed with art, both old and new, but if like me you appreciate the older architecture and art then a stop at St Mary’s Basilica is a must do in the city. Oscar Schlinders Factory If you are a history buff or simply interested in the important historical aspects of the countries that you visit you might be interested to take a guided tour of Oscar Schlinders factory. The guided tours cost around EUR 20 or you can just go for entry ticket only for EUR 11. Visit Auschwitz – Birkenau Museum Another one for those interested in history would be to visit Auschwitz. I personally made the choice with my husband that we did not want to visit. However, my cousin who is a prolific traveler and has been quite literally all over the world when she worked for the Travel Channel described this as one of the best experiences she had had whilst traveler, of course not a pleasant one, but an interesting and important look into history and what happened here. Again there are guided tours available to be booked for around EUR 40. Wieliczka Salt Mine Universally considered a must visit in Krakow is the Wieliczka Salt Mine located just outside of the city. This is a unique and incredible piece of architecture that should be experienced by all of Poland’s visitors. Entrance is around EUR 23 and guided tours are EUR 40. Take A Street Art Tour There is a lot of street art in Krakow and its relatively easy to find this on your own, you could plan you day around finding unique art pieces as you walk from gallery to gallery, or coffee shop to coffee shop. I personally like to create my own walking tour, pinning all the spots I want to go to on google maps and then finding an efficient way to walk between them all. If you are interested in finding the most impressive murals and street art include murals are Ding Dong Dumb (Piwna 3a), Judah (Św Wawrzyńca 16), Bawol Square (Plac Bawół 3), and AGH mural (Czarnowiejska 50b) onto your list. 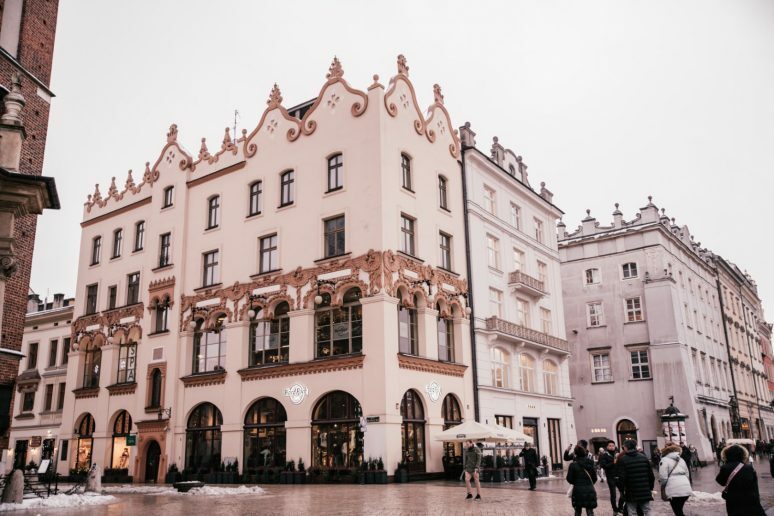 As with Zakopane there are plenty of options in Krakow, so first you will want to narrow your search by looking at the different areas in the city. We choose the magnificent Kanonicza 22 hotel. If you are ready to spurge on your trip to Poland then I cannot recommend Kanonicza 22 highly enough. There are 5 rooms to choose from and we opted for the Emperor Suite, if you take a look at the website its not hard to see why! First of all the Kanonicza 22 is beautifully decorated in grey and white, and for my friends who know me personally they know I have a very simple décor of greys and whites so this certainly appealed to my taste. But more important is the absolutely stunning bathroom, and the pièce de résistance is the private rooftop, where you can sit and enjoy a glass of champagne with a view overlooking the Wawel castle. If that’s not enough to get you excited, then perhaps the fact there is a hot tub on this balcony will! Seriously, take my advice and choose this hotel for your next visit to Krakow. Kanonicza 22 – a home away from home a few hundred yards from the Wawel Castle. Read my review of Kanonicza 22 here. Pod Nosem Again, for the splurgers reading this, head to the Pod Nosem restaurant. 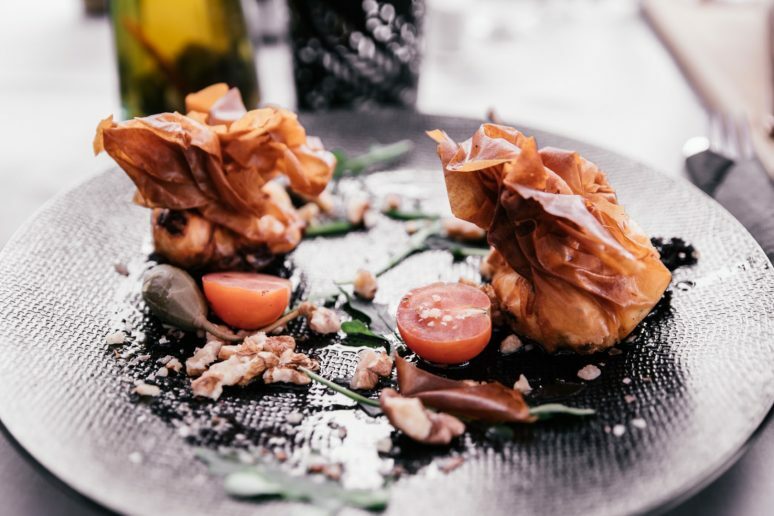 This is a Michelin starred restaurant set in a beautiful baroque style in the Kanonicza 22 hotel. We had one of our meals here whilst we stayed at the Kanonicza 22 and it was one of the most delicious meals I have ever experience, plus the ambient atmosphere is a delight for the senses! You can read my full review of the hotel and the restaurant here. Kakowskie Packzi Located close to the main square is this little bakery that serves many delicious sweet treats and the windows are filled with donuts. Even if there is a queue it’s worth waiting to get your hands on one of these delicious donuts! Lu-Kier Cafe located right next to St Joseph’s church is a cute little coffee shop with delicious cakes, I recommend trying the cheesecake. Starka Restaurant is a lovely candle lit restaurant serving traditional Polish fare. Malecon is a excellent choice if you want a rooftop view of the city over the river. In the winter you will have to sit inside, but there are large floor to ceiling windows so you can still enjoy the view. The food is delicious and reasonably priced. Folk Show in Jama Michalika Café Pre-book you tickets for a three course dinner, with a traditional Polish show. You will learn about Polish traditions folk law as performers tell stories through dance to folk music. Cyrano de Bergerac is one of the top restaurants in Krakow and is a French-style restaurant in the heart of Krakow. In fact, the location in the cellars of a medieval 15th century building is one of the restaurants main draws. If you want to keep the night going after dinner then here are a few places to try for an after hours drink or dance. Movida Cocktail Bar is another one of Krakow’s best drinking spots, it is well known for its delicious and inventive cocktails. The vibe is young and fun, with cocktails names after celebrities including the Brad Pitt and the Monica Bellucci. Wódka Cafe Bar appears on many lists of the best places to drink in Krakow and proclaims to be the hours of vodka. You can try a tasting menu of different vodkas and get acquainted with Poland’s most famous export. Pergamin Chill Out Music Bar is located near the main square on Brice Street, a little hard to find but worth the hunt. This is a popular haunt for any cocktail lover and you will be happy with the extensive cocktail list on offer. Finally, if you are nursing a hangover from the night before, you can head to Plaża which is a great summertime venue on the banks of the Vistula River. Here you can recline in a deckchair, with a bloody mary (or glass of water!) in hand and recover from your previous night out! 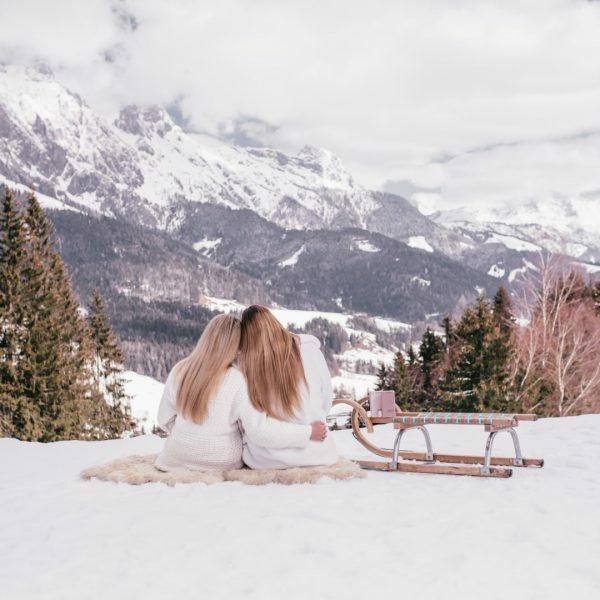 Our trip was in the second week of January, right in the middle of winter but also the perfect time to enjoy the last of the festive season and get a bit of belated white Christmas. If you prefer to visit in the summer then June / July would be a wonderful time to visit, and it would still be worth going out to Zakopane and Tatra Mountains as you would get great weather for hiking and other outdoor activities. 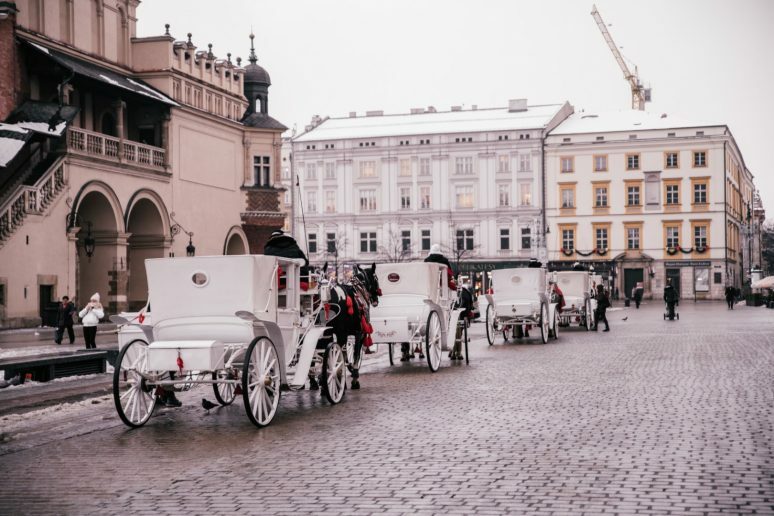 If you have the luxury of more time in Poland then I would suggest some of the following activities and cities, these places came highly recommended on other blogs and travel websites and will be on my list for my next visit to Poland! Eat fresh perogies This is a must do, pierogies are delicious pockets filled with potato and cheese or meats and are not to be missed! Try the local vodkas and lots of them! Visit the Christmas markets in December. 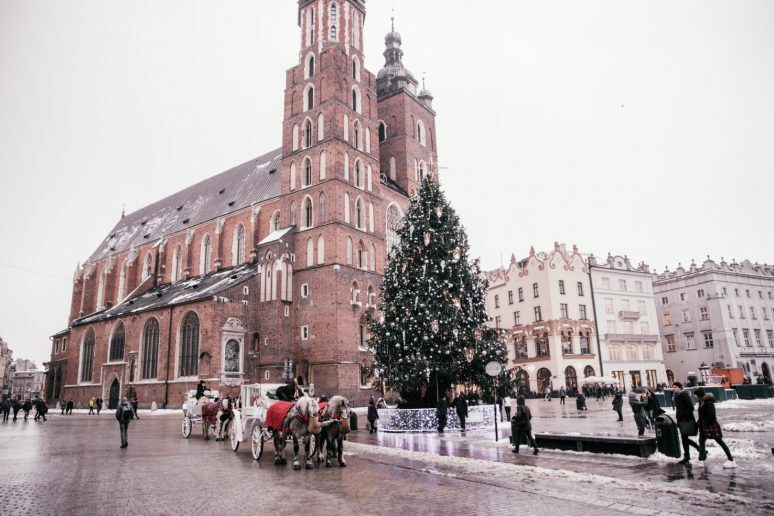 As I have mentioned Poland is quite budget friendly and offers a great alternative to some of the other expensive European Christmas Market destinations. Buy your Christmas decorations. Wandering around Krakow I found so many cute shops absolutely filled to the brim with Christmas baubles and tree decorations – this is the perfect place to pick up some unique decorations to take home. Try the local donuts. 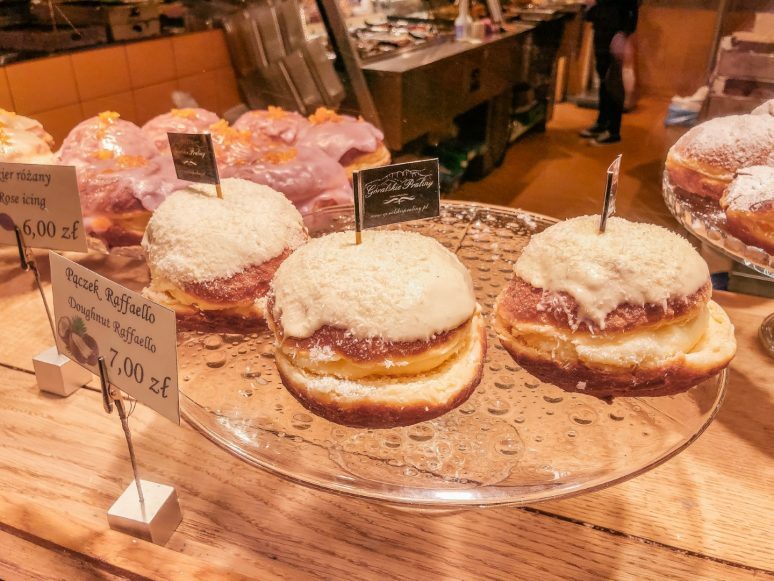 There are so many bakeries and chocolate shops and you will be hard pressed not to stop every few minutes at one of them and if you do make sure it is one that sells donuts! They are absolutely delicious and beat the Krispy Kreme or Dunkin Donuts you might be used to! I hope that you found this article useful and that it will provide you some inspiration and helpful tips for planning your own trip to Poland. If you have any questions for me, or would like to share some of your own tips with our readers then please do leave these in the comments below. And if you enjoyed this article, make sure to read my detailed Guide & Itinerary For A 5 Day Lapland Adventure in Finland. We hope that this article has inspired you to visit Poland. If you have any questions about the destination or have your own travel tips to share please leave these in the comments below.